Criminology, in general, is all about working toward making the world a better place. It's about solving and preventing crime and helping people. At the end of each day, people with jobs in criminal justice and related fields can feel good about the fact that they've had some small part in contributing to society. All that said, you still need to know how much money you will make with a job in criminal justice. Criminology careers are not about getting rich, or even moderately wealthy. In fact, if your decision to enter a criminal justice career is based on earning potential, you're likely going to be sorely disappointed. There are, however, a number of other benefits and rewards that can help make the job not only personally satisfying but financially beneficial, as well. To help you learn how you can make the most of your criminology degree, here's a quick snapshot of some of the jobs available to you in the field, along with their earning potential. Criminologists conduct research and make policy proposals for police organizations, community groups, and lawmakers. Employment is mostly through government agencies, universities and privately funded think tanks and research centers. Criminologists work in office settings and must be able to read and interpret data, conduct interviews and communicate well with others. Strong writing skills are a must. The salary range for criminologists can be anywhere between $40,000 and $122,000 per year, depending on employer and education. A career as a criminologist will require a master's degree, at a minimum. To maximize earning and employment potential, you will want to earn a doctorate in criminology or a related field. Forensic science technicians perform work both in the field and in the laboratory. Their most important job is crime scene investigation and evidence handling and processing. A forensic science technician can expect to earn anywhere between $32,000 and $80,000 per year. The wide salary differential is primarily due to education level and employer. The highest paying jobs will usually be with the federal government, though large municipalities may also pay at the higher end of the salary range. Police officers investigate traffic crashes and minor crimes and provide assistance to the public. They make arrests and enforce traffic laws. They may also assist in serving warrants and securing and investigating crime scenes. 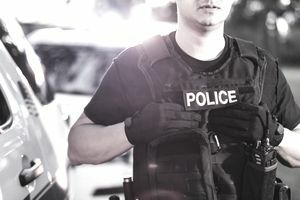 Specific requirements for a career as a police officer will vary between agencies and jurisdictions, but as far as careers go, a police job is perhaps one of the best opportunities for both those with and without college degrees. Police officer salaries will range between around $30,000 and up to $90,000, though the starting salary will usually be in the low 30 to 40,000s. Many departments offer stepped pay plans and longevity pay, so the longer your career, the more you may be able to earn. In addition, careers in policing often offer a number of opportunities to promote and rise through the ranks. Forensic psychologists have a wide variety of job functions, and the title itself may refer to a number of different jobs. Simply put, a forensic psychologist is a psychologist who works with the law in some capacity or another. This may include jury consulting, prison counseling, criminal profiling, psychological evaluations of defendants and many other careers. Forensic psychologists may be employed by local governments and circuit courts, or by state or federal prisons. In many instances, such as in the case of jury consultants, forensic psychologists are private practitioners. Forensic psychologists can expect to earn between $50,000 and well over $100,000 per year. As in the case of criminologists, an advanced degree will be required, preferably a doctorate. The higher earners will work as private practitioners and consultants. Of course, these are only a few of the criminal justice jobs available to those who choose to enter the field. When making a decision on which career to pursue, it's also important to consider other benefits, such as health insurance and retirement. In some cases, you may wish to accept a lower salary in exchange for more lucrative retirement benefits. In any case, make sure the job is right for you and consider the duties, work environment, and educational requirements. With the proper research and groundwork, you'll be certain to find a fun and rewarding career.